Artist and theorist, Kandinsky was a huge influence on the direction of 20th century art and this website features an in-depth study of his entire career, including paintings and drawings. Kandinsky paintings are exceptional examples of Abstract art from the 19th and 20th century at a time when Wassily Kandinsky was at the forefront of the rise in modern art which was to lead to all the different contemporary paintings and movements that we can enjoy today. This website covers all of his finest paintings alongside information on the life and career of this skilled and innovative painter. Wassily Kandinsky was an exceptionally intelligent man who spent alot of his early life as a teacher before heading into art where he initially took time to develop the style which was to become so recognisable by the end of his career. It was not until he was 30 did Kandinsky start to produce paintings as a result of his art studies which were to help develop Wassily into an artist. Kandinsky paintings predominantly follow his abstract approach which is part of the broader movement of expressionism which includes predominantly artists from the late 19th century up to the present day. The likes of Franz Marc, Piet Mondrian and Jackson Pollock all fall into the expressionist category although it is fair to say that their own paintings do not look that similar to those of Russian Wassily Kandinsky. The abstract expressionist style of Wassily Kandinsky is remembered for it's complex arrangements of contemporary objects and shapes, normally made out of clear primary colours or sometimes with gradients. Many of these objects would be grouped together to give the illusion of actual real things, though only after careful examination meaning the many Kandinsky paintings are interesting pieces with great longevity. Wassily Kandinsky paintings are seen frequently in high profile exhibitions across Europe and North America in the present day. The original paintings are also highly sought after as reproductions for his thousands of fans around the world, with them normally opting for copies in the forms of framed art prints, posters and stretched canvases for their own home and office walls. Wassily Kandinsky was a highly intelligent individual who was also a theorist within art, which was unusual when compared to other abstract artists who commonly sought simplicity within their own style. One common hallmark of an artist with a strong legacy, though, is someone who questions the status quo and looks into his own paintings deeply, and Kandinsky is certainly someone who did that. 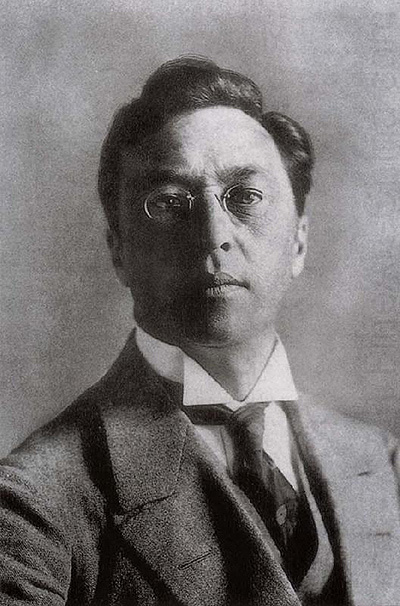 Kandinsky's theorism went to the extent of publishing several books of his research findings and the artist was also to be strongly linked to the Bauhaus movement which was itself a group who looked deeply into the construction of art within society at that time. The artist later became part of the Die Blaue Vier (Blue Four), with Klee, Feininger and von Jawlensky, which was formed in 1923. It was around this time that Kandinsky started to feel more comfortable displaying his work in the USA as Europe became increasingly unstable and hostile. For those interested in the early days of Kandinsky's career as his style progressed from experimental beginnings, Der Blaue Reiter is probably the best known painting of this time, coming along in 1903. Der Blaue Reiter contrasts massively to his later abstract works and features a man riding across a landscape on a horse, with a colourful background. The natural qualities of this painting make it very appealing to some who might not like his abstract paintings which followed some years later. Munich-Schwabing with the Church of St. Ursula is another example of Kandinsky in his early days where colour was used within landscape paintings and in a very bright method. These natural paintings are likely to have proved popular even by themselves but the artist was later to divert into a far more abstract approach later on which itself gained a new set of supporters, showing the flexibility of the artist. It is easy to see from his early paintings that Kandinsky had been influenced by the impressionists such as Claude Monet, though this influence faded as the artist grew stronger and more confident in his own ideas and took his bright use of colours into new abstract avenues. Composition VII is seen by most, including the artist himself, as the most complicated work to have come from his career and was painted back in 1913, just before the outbreak of WWI. It features his typical flurry of primary colours but in a manic form which is truly expressive, and this contrasts with some of his other abstract works that stick to clearer lines and a greater segmentation of objects. In Composition VII there is a real blur between one object and another, adding to the height of excitement and energy across the painting. See also Composition VIII. Wassily Kandinsky also painted other styles of works earlier in his career and many of these have also retained popularity, containing their own strengths and creative flair. The most famous painting from Wassily Kandinsky remains his Concentric Circles piece which contains circles within squares. You can find more on Kandinsky circles here. You can see an image of Concentric Circles (Farbstudie Quadrate) below. Wassily Kandinsky is most famous for his lively compositions which came at the height of his career when he had truly settled on a form of abstraction which involved clear shapes with bold, primary colours which many find instantly accessible and suitable in today’s contemporary lifestyle, some 100 years after being created by Kandinsky in the first place. Kandinsky was also an art theorist who would use his paintings to output and experiment with his different findings which normally involved research into colour. Wassily Kandinsky is seen as both a popular painter but also a highly significant one because his own work with abstraction was amongst the very first to appear within the western world, at a time when resistance to it was stubborn and strong. Many years passed by before abstract artists could really claim to have achieved mainstream acceptance and academic respect. Even in today's open society and wide ranging arts scene, many still refuse to see qualities in the work of artists such as Kazimir Malevich, Wassily Kandinsky, Joan Miro and Piet Mondrian. You will see that most of the paintings included in this website contain bright colours and this was very much a secret to his success, with other notable artists known specifically for their highly skilled use of colour including Pablo Picasso, Franz Marc and Marc Chagall. Their styles were somewhat different but all fall loosely under the contemporary art umbrella which covers a period of time when colour was becoming even more important than it ever had within art. Improvisation No 31 is a fine painting from an artist who used relatively blurred lines here and more gradiented colours whereas other abstract pieces from his career held stronger and more distinguised areas. Both methods attracted different sets of fans and both together appreciated his exceptionally bold use of colour which helped lead the way for artists who followed. There is some similarlity with the likes of Franz Marc to the point where it is highly unsurprising that the two spent a lot of time together as part of the brief Der Blaue Reiter movement. Murnau Garden, below, is one of several paintings that used landscape painting within a highly abstract style and this series has given us some of Kandinsky's most popular paintings, striking an ideal balance between object and abstract that many can understand and appreciate. Some of the more abstract compositions seem to polarise opinion a little more wildly. It is possible to truly understand the path and development of this artist throughout his career by looking at the changes in his paintings year-on-year, which culminated in the most abstract works coming at the end. Murnau Garden is included above and there were several of these, I, II and III. You can easily distinguish the various block of colours and the objects which they deliver, though the title does help in quickly getting to grips with the details in this piece. This is another of the Kandinsky pieces which bears great similarities to Franz Marc's own style which concentrated on striking a balance between real objects within an abstract environment. Kandinsky paintings are particularly famous in the modern day, with modern media helping to spread the reputation of artists quickly and thoroughly right across the world. This Russian artist has paintings on display right across Europe, with some held in America too. In most cases they are happily owned by national institutions meaning that they can be viewed relatively easily, though some remain in private collections. Yellow Red and Blue is another interesting abstract work which uses simple objects to create a certain look, which in this case is the head of a man. As Kandinsky's work became more abstract it was harder to immediately recognise the exact meanings of his constructions. Farbstudie Quadrate is amongst the most reproduced of all modern art paintings and is instantly recognisable with it's circles and squares, though many in the mainstream art public are entirely unaware that it came from the career of Russian Wassily Kandinsky. Farbstudie Quadrate is ready to buy from the links above as a framed or framed giclee art print, poster or stretched canvas in the Art.com Kandinsky gallery. This website offers a gallery of the finest and most famous paintings from the career of Wassily Kandinsky and each is accompanied by links to the Art.com Kandinsky prints gallery where you can buy your own copies of any of them at excellent prices. We buy from Art.com on occasion ourselves and are happy to recommend this excellent company who specialise in giclee art prints, posters and stretched canvases with an incredible amount of art available, totalling up to 500,000 different paintings to pick from. Farbstudie Quadrate, below, is the most popular reproduction Kandinsky reproduction print available and is also known as Concentric Circles or Circles in Squares. Farbstudie Quadrate is probably the most important painting found within this website, and certainly the best known within mainstream art followers. There are frequent exhibitions of his work which aim to bring together as many of his best paintings as possible from their various locations and these opportunities should not be missed as they are hard to organise and are excellent ways to appreciate his original works together. We hope that this website has provided you with plenty enough information on this exceptional abstract artist and that the gallery of Kandinsky images are of interest. There will be further information and paintings added in future, as well as potentially some translations of these pages into other languages to help spread the name of this highly talented painter who began in Russia but finished with a reputation which has spread right across the world. Color Studies is an example of how Wassily Kandinsky was a highly theorical artist who spent a lot of time researching new ideas which was crucial to him developing art movements and styles which had never been seen before. So much of his own work was original, be it the shapes, the meaning behind each of them, or the colours used to create them. The paintings created by Kandinsky has been classified in the groups of expressionism and abstract art which are relatively large art movements which contain quite wide varieties of artists and methods. Wassily Kandinsky spent much of his early years producing mainly more traditional style paintings and it was only after his research and theoretical work that he began to create things which had never really been seen before. Many actually prefer his original works and find them an excellent balance between traditional topics such as landscapes but with elements of his own creativity, such as highly vivid colour schemes which were later carried over into his more abstract periods. Der Blaue Reiter was a painting of a horse and rider making it's way across the landscape that became the name given to a group of artists which contained Wassily Kandinsky, August Macke and Franz Marc who held several exhibitions before their partnership was curtailed by the outbreak of the First World War. Some literature from these individuals was to defend and promote the rise of abstract art and aim to set the record straight with regards the ideas behind it and the likely development of it over coming years.